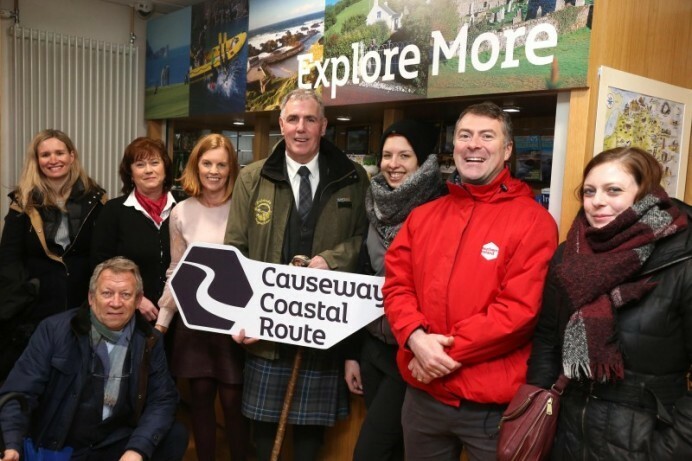 A group of international tour operators have enjoyed some of the Causeway Coastal Route’s beauty and attractions during a recent familiarisation trip. The experience followed on from their participation in Meet the Buyer, Northern Ireland’s biggest annual tourism networking platform. During their time in the Causeway Coast and Glens Destination, the group took in the unique landscape of Rathlin Island, including lunch in The Manor House and a visit to the must-see RSPB Seabird Centre. They spent the night in Ballycastle at the Marine Hotel, where they enjoyed a lesson in soda bread making from Head Chef Pol Shields. The tour also provided an opportunity to stop off at the popular viewing point at Portaneevey and the beautiful ruins of Dunluce Castle. A group of international tour operators who recently enjoyed a familiarisation trip in the Causeway Coast and Glens destination pictured with Mark Rodgers from Dalriada Kingdom Tours, Brian Connolly (Tourism NI), Yvonne Doherty, Ballycastle Visitor Information Assistant and Kerrie McGonigle Tourism Destination Manager, Causeway Coast and Glens Borough Council.